And there you have it! 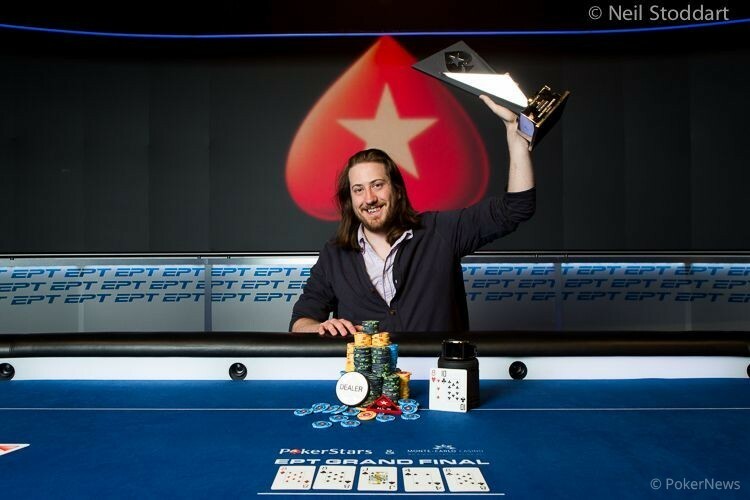 Steve O'Dwyer is the latest European Poker Tour champion as he managed to take down the PokerStars and Monte-Carlo® Casino European Poker Tour Grand Final for €1,224,000. O'Dwyer beat a field of 531 players, but more importantly he outlasted arguably the toughest final table recorded in EPT history. The first player to hit the road was Australian Grant Levy. 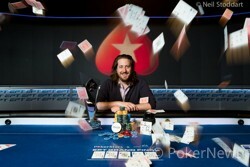 Levy previously won APPT Sydney and ANZPT Melbourne but he would not add an EPT title to that today. Levy started the day as the short stack and was knocked out by Andrew Pantling. Pantling raised to 83,000 and Levy three-bet from his immediate left to 205,000 and the Canadian proceeded to make the call. The flop rolled out jack-high with two clubs and Pantling check-called Levy's 400,000-chip shove. Pantling showed jack-ten of clubs against Levy's ace-king. The turn brought the ace of clubs and that sealed the deal. Pantling made a straight and knocked Levy out who will bring €103,000 back Down Under. Team PokerStars Pro Jason Mercier was the short stack after Levy's depart but managed to double up soon after that. Unfortunately for the former EPT San Remo he was the next to go though. Mercier ended up all in preflop with queen-ten after Johnny Lodden raised from the cutoff to 80,000. Mercier was seated in the small blind and Pantling woke up behind him with ace-queen suited. The board did not bring any help and Mercier was gone in sixth cashing €137,000. Pantling regained the lead after this hand as he and O'Dwyer kept battling it out for the top spot throughout the day. After a quiet hour the final table exploded as both Team PokerStars Pro Jake Cody and Noah Schwartz were knocked out on the same hand. Team PokerStars Pro Daniel Negreanu raised to 115,000 from the cutoff after which Schwartz moved all in from the button for 630,000. Cody moved in over the top for 860,000 total and Negreanu snap-called. The last remaining EPT winner, Cody, turned over jacks, Schwartz showed king-ten offsuit and both were far behind Negreanu's aces. The board brought mere blanks and Negreanu put himself in a great position for his first ever EPT title and the Triple Crown. 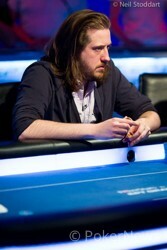 Schwartz finished sixth for €189,000 while Cody took home €251,000 for his fifth place finish. Pantling started four-handed play with a big chip lead over O'Dwyer, Negreanu and Lodden. The latter was the short stack but wouldn't remain in that position for long. Negreanu got Lodden to call all in with two nines against the Canadian's queens, but Lodden turned a nine to give him a set. Negreanu was now the short stack while Lodden jumped into second place. Not too long after this hand the WSOP APAC Main Event winner busted. Lodden raised to 110,000 with ace-queen of diamonds and Pantling called from the button with ace-seven suited. Negreanu grabbed this opportunity and moved all in for 2.775 million chips and Lodden made the call. Negeanu showed two fours and those did not hold up as Lodden rivered broadway. Negreanu added €321,000 to his impressive live tournament poker resume. With this cash Negreanu jumps over Erik Seidel, Phil Ivey and Phil Hellmuth into third place behind the One Drop finalist Sam Trickett and Antonio Esfandiari. On the All-Time Money List that excludes tournaments with a buy in $50,000 or higher Negreanu was already the number one and he extends his lead on Hellmuth. Three-handed play was fast and furious, and it could've gone in anyone's direction. All three players had the chip lead at some point during this battle, but eventually Lodden had to let the other two go. First, Lodden called O'Dwyer's five-bet shove with queen-ten and he was up against two sixes. 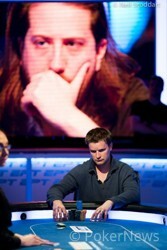 The board did not improve Lodden's hand, and he was knocked down to below two million. Shortly after this massive pot, Lodden was knocked out by O'Dwyer. O'Dwyer raised to 150,000 with ace-ten and Lodden three-bet to 400,000 with ace-jack. O'Dwyer tanked for a bit and called. The flop was seven-four-ten rainbow and Lodden fired out 350,000, O'Dwyer called. On the turn the three of spades showed up and Lodden moved all in for 1,450,000. O'Dwyer snap-called with top pair top kicker and the river brought a meaningless king of diamonds. Lodden won €467,000 and that is the biggest single result in his live tournament poker career. With this cash, Lodden jumps into third place on the Norwegian all-time money list behind Annette Obrestad and Jan Sjavik. The heads-up battle between Pantling and O'Dwyer started with a two-sentence deal conversation. Pantling politely declined O'Dwyer's offer to talk numbers, and play started with the Canadian having a slight chip lead. The chip lead went back and forth plenty of times and O'Dwyer started the one-hour dinner break with a 9.2 to 6.7 million chip lead. After the dinner break, it was all O'Dwyer as he extended his lead right away by winning a massive pot. O'Dwyer raised to 240,000 from the button and Pantling three-bet to 800,000 with six-three off suit. O'Dwyer called with ace-ten and the flop brought ace-eight-three rainbow. Pantling bet 975,000, O'Dwyer called, and the turn brought the queen of clubs. Pantling fired a second bullet worth 1,575,000, and O'Dwyer called once again. The river brought another ace and both players checked. O'Dwyer took down this massive pot and took an almost two-to-one chip lead. On the final hand of the tournament, O'Dwyer raised to 240,000 with ten-eight off suit and Pantling called from the big blind with king-five of spades. The flop brought two eights but also two spades giving Pantling a flush draw. Pantling check-called 300,000, and the turn brought the four of spades, giving the Canadian a flush. Pantling check-raised a 600,000-chip bet to 1,425,000, and O'Dwyer decided to move all in. Pantling called immediately, risking his tournament life. In an unbelievable turn of events, the eight of clubs hit the river and O'Dwyer turned his trips into quads. Pantling was knocked out and took home €842,000 for his second place finish. After making four EPT final tables in just 18 months, O'Dwyer managed to take one down and he won the €1,224,000 first-place prize. That's it for now from Monte Carlo, and we would like to thank you for following all our Main Event coverage throughout the ninth EPT season. The Main Events are done, but the poker continues right here tomorrow at 12:00 CET as the €100,000 Super High Roller kicks off with, among others, Phil Ivey, Patrik Antonius, Viktor Blom, Negreanu and the latest winner himself. Steve O'Dwyer raised from the button to 240,000 with and Andrew Pantling called from the big blind with . The flop brought out and Pantling check-called 300,000. On the turn the hit and Pantling checked again, after which O'Dwyer bet out 600,000. Pantling, who had turned the second nut flush, raised it up to 1,425,000 and O'Dwyer tanked for a while before raising all in. Pantling snap-called the shove, and was in great shape to double up and take a two to one chip lead. The river turned everything around and sealed the deal as the popped up! O'Dwyer rivered quads and knocked Pantling out in second place. Pantling will go home €842,000 richer but the title, the trophy and the biggest prize will go to O'Dwyer. Steve O'Dwyer raised to 240,000 on the button with , Andrew Pantling three-bet to 800,000 with , and O'Dwyer called. The dealer fanned , Pantling led out for 975,000, and O'Dwyer called. The dealer rapped the table, burned a card, and turned the . Despite having bottom pair, Pantling decided to fire a second bullet worth 1,575,000, and the American-Irishman called again. The completed the board, giving O'Dwyer trips, and Pantling slowed down, checking for the first time. O'Dwyer opted to check behind, not seeing the value in betting, and took down the 6.7 million-chip pot. The cards are back in the air with the blinds at 40,000/80,000/10,000. Play at the final table will resume in one hour! Steve O'Dwyer raised on the button with , Andrew Pantling defended with , and the flop was . Pantling checked, O'Dwyer continued for 380,000, and Pantling called. The turn was the , both players checked, and a repeat king - the - completed the board. Pantling check-folded to an 800,000-chip bet, and O'Dwyer raked in the pot. Andrew Pantling raised to 230,000 from the button and Steve O'Dwyer called from the big blind with . The flop brought and O'Dwyer check-called 315,000. On the turn the hit and O'Dwyer check-called 640,000. The river brought the and this time Pantling checked behind with his . O'Dwyer took down the pot with trips and is back in the lead.